Today is National Cheese Lovers Day! When I think of cheesy foods, the first thing that comes to mind (and my absolute favorite) is pizza. 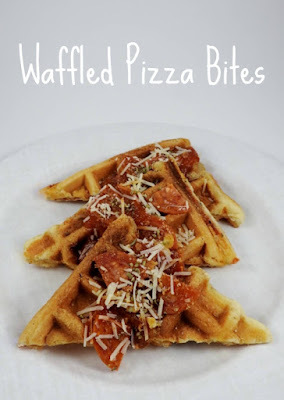 I was flipping through one of my cookbooks and spotted these Waffled Pizza Bites from Deidre C.
Waffles are another one of my favorite foods, so the idea of combining the two of them together just sounded so good to me! I love that the recipe starts with a couple of cans of crescent roll dough, I always keep some on hand. If you can snag the un-perforated sheets, then it saves you from having to pinch seams. I'm going to admit, I used more cheese than what was called for. I had 2 cup bag of mozzarella, and I combined it with the 1/2 cup Parmesan. I made them two ways. The first set I did as the recipe stated. The second, I spooned some sauce inside. Not a lot, maybe 1/4 cup or so. You don't want to overload it so that it oozes out or you'll have a mess to clean up. These were going so fast, I had to hide some to take pictures. Speaking of pictures, I really wish I had the photography skills to get that shot of the cheese just oozing out of the waffles, but I don't. Please rest assured that the center of these waffles are stuffed with cheesy deliciousness. I sprinkled some more Parmesan and pepperoni on top for good measure. Thank you so much to Amy from House of Nash Eats for hosting and to all of the #FestiveFoodies for sharing their #NationalCheeseLoversDay recipes! Be sure to go and see what they made by using the links down below. In a small bowl, combine the cheeses, basil and oregano. Separate each roll of crescent dough into two 7x6-in. rectangles; seal perforations. Place one rectangle on a preheated greased 8-in. square waffle maker (dough will not cover entire surface). Layer with half the cheese mixture and half the pepperoni to 1/2 in. of edges; top with another rectangle. Bake until golden brown, 4-5 minutes. Repeat. Remove to a cutting board and cool slightly. Cut each rectangle into four triangles; serve warm with pizza sauce and, if desired, toppings. What a delightful recipe! I think these would be so fun to serve. Wow! How cool is this! Cheesy filled crescent rolls made into waffles is genius! Genius! Perfect snack or lunch too. Great minds Jolene.....Bring on the PIzza!!! I love that these are made with crescent roll dough! And I do the same thing of always adding more cheese than called for, lol. Anything that is in pizza form is a hit with my kids, so this is a recipe that they are sure to love! My boys would love this! They would get such a kick out of two of their favorites being combined into one! It looks delicious!